So after all that — months of trade rumors and rumblings about whether Russell Wilson wanted to stay in Seattle and if the Seahawks really wanted to keep him — the two sides remained married. For at least another five years, anyway. And they did so with a contract that was pretty much in line with what most observers figured all along might be what it would take to get it done — a four-year extension worth $35 million a season ($140 million overall) that makes him the highest-paid player in NFL history. Add that onto the one year he had left on his current deal, and Wilson can make $157 million through the 2023 season on a contract that keeps him with the Seahawks until he is 35. There had been talk that Wilson wanted to set some other precedents with this contract — specifically, maybe tying the contract to rises in the salary cap, an attempt to assure that his salary would always stay at the top of the market (rising salaries of other players meant Wilson went from being the second-highest paid player in the NFL in July, 2015, to 14th-highest before agreeing to his new deal Monday). But now that we’ve seen most of the fine print, turns out that the deal is pretty much as conventional as any other in its structure with no salary cap tie-ins — though there is a no-trade clause, said to be at Wilson’s request — and also no guaranteed money other than for injury after the first season, preserving Seattle’s recent trend of not guaranteeing money after the first year of a contract. Indications are that Wilson’s camp fought for the cap tie-in until the last minute as well as a few other potential precedent breakers. Michael Silver of NFL.com reported Tuesday afternoon Wilson’s agent, Mark Rodgers, wanted it written in the contract that the Seahawks could not use a franchise tag on Wilson following the 2023 season, assuring he would become a free agent then unless signed to another big extension by Seattle. The Seahawks didn’t cave any of the precedents setters, but did up the ante financially, specifically in the form of a higher signing bonus — $65 million, the highest in NFL history, with Wilson being guaranteed $70 million in the first year of the contract. That is said to have finally broken the ice after four days of negotiations between the Seahawks and Rodgers, who is based in Florida and arrived in Seattle Friday with the hope of getting the deal done by Wilson’s stated deadline. And ultimately making it the proverbial win-win — Seattle kept true to its contract principles while Wilson got the benchmark payday that was surely the one thing he had to get to agree to stay. NFL Network reported that Seahawks general manager John Schneider walked that final contract offer down the hall to Rodgers, at 11:30 p.m., 30 minutes before the clock struck midnight on Wilson’s self-imposed deadline of April 15. That’s literally a check Wilson gets the minute he signs the contract, or a healthy chunk of it anyway. Wilson signed the deal Tuesday afternoon, shortly after which the team announced it, making official something that might have seemed to many to be in grave doubt roughly 15 hours earlier. That the contract makes Wilson the highest-paid player in NFL history (for the moment, anyway) means he certainly got a lot financially out of the deal. But his agent, Rodgers, said in a statement to The Seattle Times that what was ultimately most important for Wilson than setting any precedents in terms of guarantees or cap tie-ins, was staying in Seattle. Wilson’s apparent desire to stay in Seattle, and willingness not to push the envelope too much to try to get the team to make some unprecedented concessions, flew in the face of much of the discussion over the last few weeks, notably a rumor started by sports talk show host Colin Cowherd of FS1 that Wilson’s wife, entertainer and singer Ciara, preferred for the couple to be based in New York and as such, Wilson wanted to be traded to the Giants. 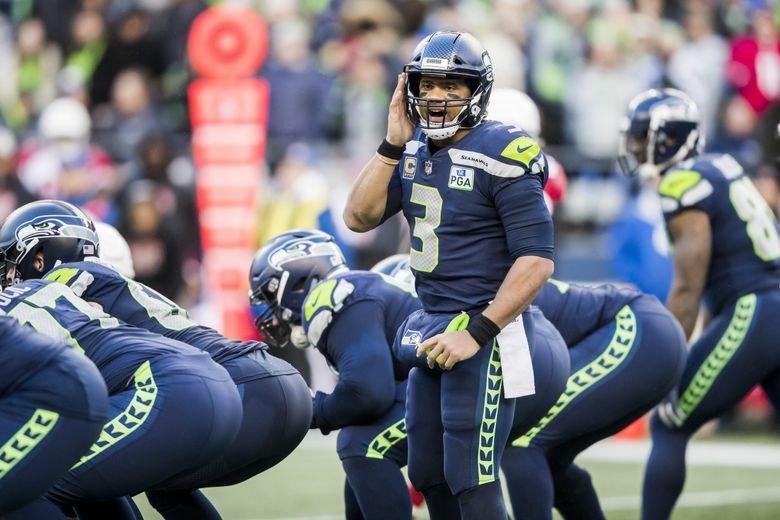 But the rumor and others like it lingered, and grew only more intense when it was revealed — in a story first broken in The Seattle Times on April 2 — that Wilson had set an April 15 deadline to get a new contract. Why seem to complicate things — no one had ever heard of an April deadline before for an NFL player to get a contract extension — if he just wanted to stay put? The response was that Wilson wanted to get it over with. In 2015 he set a deadline of the start of training camp to get a new contract, and the two sides came to agreement at the 11th hour the night before. His side figured this time that nothing would change in terms of what Seattle could offer — or what Wilson would want — from spring to summer, so why not get it done now? That way, Wilson didn’t also have to deal with an offseason of questions and wondering about his future. Getting it done quickly also may have given Wilson whatever assurance he may still have needed about how the team feels about him. That may seem a silly notion — it’s worth recalling again the Seahawks made him the second-highest paid player in the NFL with his 2015 contract at $21.9 million per season, just $100,000 less a year than Green Bay’s Aaron Rodgers. And wasn’t it this time a year ago that seemingly every national outlet had some sort of story about the Seahawks choosing to tie its future to Wilson over other seminal Seahawks such as Richard Sherman and Michael Bennett? But everybody wants to be wanted, and in the high-stakes world of professional sports, it’s money that conveys feelings the best. So now, the Seahawks head into the rest of their offseason with their biggest question answered. But many still linger, specifically the fate of fifth-year defensive lineman Frank Clark. Clark received a franchise tag in March that will pay him $17.1 million in 2019. Clark, though, would rather have a long-term deal, one likely paying him in the $18-21 million a year range over four to five seasons. Some have wondered if Wilson’s deal will preclude any other big deals and mean they can’t pay Clark. While a full accounting of the deal still awaits, it is expected that Wilson’s contract will account for about 14 percent of the team’s salary cap in 2019 — basically what it had been expected to before the deal — and then from 15 to 19 percent in the last four years of the deal. But that’s assuming current cap level increases. Odds are, the cap increases with new revenue streams following the league’s new Collective Bargaining Agreement in 2021, meaning Wilson could well stay at about the same cap percentage as he has been. But Seattle has ample cap space in 2020 and beyond — $83 million in effective cap space before the Wilson deal, sixth-most in the NFL according to OvertheCap.com — and can get a deal done with Clark if it really wants. The question will be if Seattle wants to — such a deal would make Clark among the top three or four paid defensive players in the NFL and the Seahawks will have to weigh if they think Clark is worth that. And they’ll also have to weigh how that might impact talks with middle linebacker Bobby Wagner, who is also entering the final year of his contract. Wagner is averaging $10.75 million on his current deal but will want a significant raise to stay, especially after the Jets handed C.J. Mosley $17 million a year last March. Seattle’s hope will be that Wagner – who is acting as his own agent —- may settle for a little less, with Mosley’s deal viewed by many around the NFL as an outlier at almost $5 million per year more than the next highest-paid inside linebacker, Carolina’s Luke Kuechly, who makes $12.3 million per season. But would Wagner take a deal paying him substantially less than Clark, even if he understands that the market for each is hugely dependent on the positions they play and the perceived value of their roles? Defensive tackle Jarran Reed also would like an extension as he enters his final season. But while there have been plenty of key players who led to the rise of the Seahawks during the Carroll/Schneider era, which began in 2010, it was the addition of Wilson in 2012 that was the key to it all, and what the team knew was the key to keeping it going. Seattle has won nine or more games every season since and made the playoffs all but once, with Wilson in just seven seasons already having broken most of the team’s single-season and career passing records. But if Wilson’s Seahawks career remains defined in part by a time the team called for him to pass rather than run, the team made clear Monday night that it wasn’t going to ever pass on Wilson himself.